BodyCombat is one of our most popular group fitness classes at O2 Fitness, but what if you've never even heard of this class - let alone tried it? The name may sound a little intimidating - "COMBAT?!" - but chill! 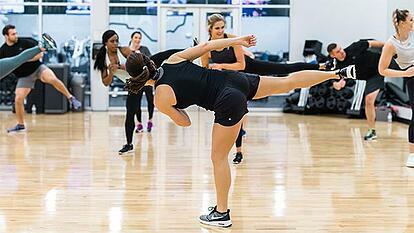 BodyCombat is a non-contact, mixed martial arts-inspired cardio class. No one's hitting anyone or anything! After just a few minutes in a BodyCombat class, you'll quickly understand why our members find this class so addictive! BodyCombat is a 55-minute, full-body workout with simple, easy-to-follow moves like punches, kicks, knees, elbow strikes, and blocks. Because it's inspired by Mixed Martial Arts, you'll experience strikes from an array of disciplines like Boxing, Karate, Tae Kwon Do, and Muay Thai. To prepare for a class, grab a bottle of water, a towel (heads up: you're gonna sweat! ), and wear some good, supportive shoes. Your instructor will always offer options for any high impact, intense exercises, so you can tailor every BodyCombat class to suit your fitness level. If you're a newbie, take the lower-intensity options, or just do half the class. And if you're well along in your fitness journey, looking for that next level in your training? This workout will push you to your edge and give you the confidence to do things you never thought possible! We recommend taking BodyCombat 2-3 times a week. Efficiency– In one hour, BodyCombat checks all the boxes for an effective workout: you get cardio, strength, and core training in one workout. While BodyCombat is primarily a cardio workout, you'll also do strength and conditioning exercises like push-ups, burpees, squats and lunges. BodyCombat will improve your core strength through what's known as "reactive core training." This type of training works with your natural reflexes and the way your muscles are "wired" to respond to the movement you're doing. Every punch, kick, block, and strike forces your core to react in a way that mimics the core activation and strength you need for every day life. A recent study at Penn State University found that the core activation in a BodyCombat class is the equivalent of doing around 1700 crunches! [source] Moves like the front kick and fast alternating jabs yield up to 2.3 times the core activation of a standard abdominal crunch. By the time you've finished a BodyCombat class, you'll feel empowered and totally unleashed! You'll know you were challenged and pushed to your limits, but thanks to your instructor, the music, and the people beside you, you wanted to go there - and you can't wait to do it again. "For me, BodyCombat is like therapy. Whatever I need that day, this workout gives me. Whether it's a tough workout, time with friends, a chance to not take myself too seriously, an opportunity to feel strong in my body - or all of it at once! I always feel better walking out of BodyCombat than I did walking in," says Melanie Balance, a front-row regular in BodyCombat classes at O2 Fitness Falconbridge. After taking the BodyCombat classes at O2 Fitness, you’ll feel accomplished and strong - and you might even make some new friends to fight alongside in your next class! Check the Group Fitness schedule to find the BodyCombat class nearest you this week! When you get there, be sure to let your instructor know you're new - and let us know how it goes!